Vanderbilt announced at this year’s IFSEC International the ACTEnterprise. Along with demonstrations of the solution, visitors can explore the wide range of products that Vanderbilt has to offer at Stand F305, with a significant focus on increased integration both within and with third-party systems. 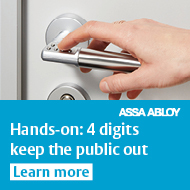 “As such, Assa Abloy Aperio wireless components now integrate into the Vanderbilt ACT system. Moreover, the wireless functionality of the Aperio components are faster to install, meaning a cost-effective solution for adding mechanical door locks to an existing system, as well as requiring minimal additional hardware,” concludes Fulton. Integration will continue to be a priority, with significant focus being placed on technology partnerships that enhance Vanderbilt’s functionality and reach in the market. On top of ACTEnterprise’s integration with Assa Abloy, the solution also interfaces with Vanderbilt's award-winning intruder detection system, SPC. In addition, the much-touted SPC-Milestone plugin will be on display. “These solutions require no server specifications, no SQL, and no complicated network routing. All diagnostics, technical issues, and servicing can be carried out from a web-based portal or smartphone. Plus, they provide the opportunity to earn recurring revenue by charging the customer for hosting, additional customer service and providing fully managed security services,” states O’Riordan.